At the opening of the Boao Forum for Asia Annual Conference 2018 in south China's Hainan province last April, Chinese President Xi Jinping announced a string of measures to expand opening up. They included broadening market access, improving the investment environment, strengthening intellectual property right (IPR) protection and expanding imports. The past year has seen these measures implemented and bearing results. The National Development and Reform Commission and the Ministry of Commerce jointly released a revised version of the Special Administrative Measures for the Access of Foreign Investment, commonly known as the National Negative List, on June 28, 2018, lowering the threshold for foreign investors in 22 areas. A new negative list for foreign investment in the country's pilot free trade zones (FTZs) was issued two days later, further expanding opening up in these zones that have been established as test sites of new policies to explore new development models and better integrate the Chinese economy with international practices. The most eye-catching move is the broadened access to the financial sector including banking, securities and insurance. The restrictions on foreign ownership in joint ventures and the businesses open to foreign financial institutions have been eased. In addition, China reformed the renminbi exchange rate regime and accelerated the process of making the renminbi convertible under the capital account. While broadening access for foreign capital, the country also highlighted risk prevention and supervision over the financial sector. With the implementation of the shortened negative list for foreign investment, substantial progress was made in streamlining related administrative approval procedures and promoting investment liberalization and facilitation. In particular, the openness of the financial sector has allowed foreign capital to invest and operate in China in a freer manner. This has enabled them to share the opportunities stemming from China's financial market development and increase the supply of capital. The measures have promoted competition, stimulated innovation, improved the capacity of financial services and invigorated the capital market. More open Chinese financial and capital markets hold out the prospect of fast development. Since April 2018, China has stepped up the creation of a law-based, internationalized and facilitated business environment. Specific measures were introduced to keep in line with advanced international economic and trade rules, increase transparency in the government's decision-making process and improve the legal system. Reforms were also launched to streamline the administrative approval procedures, reduce corporate costs, grant equal treatment to domestic and foreign enterprises, and build up a fairly competitive market environment. According to the World Bank's Doing Business 2018 report, China's ranking in the ease-of-doing-business index improved from 78th to 46th place out of 190 economies. With the adoption of the Foreign Investment Law by the National People's Congress on March 15, China's business rules, regulations and policies will become more predictable. As part of China's efforts to speed up the establishment of a new system for open economy and promote the formation of a new pattern of opening up, Xi announced on April 13, 2018, that the entire island province of Hainan would become an FTZ, China's largest, by 2020, and then a free trade port. A general plan for the Hainan pilot FTZ was rolled out on October 16, 2018. In 2018, the State Intellectual Property Office was restructured, seeking to integrate both patent and trademark administration into one regulatory authority. The new agency led the establishment of a cross-department mechanism for punishing serious patent violations, carried out trademark and patent law enforcement campaigns and established more intellectual property protection centers. China is also amending the patent law to give it more teeth. The fourth draft amendment increased the compensation for patent infringements to a range of 100,000 yuan ($14,910) and 5 million yuan ($745,500). For online violations, Internet service providers will be held liable. In December 2018, the Supreme People's Court established an intellectual property court, a milestone in the history of intellectual property litigation in China. IPR has to be protected not only because it is in the interests of both Chinese and foreign enterprises, but also because it provides an institutional guarantee of technological innovation. It is an institutional basis for transforming and upgrading the economy and making China a country of innovators. China substantially lowered import tariffs in 2018. On May 1, 2018, import tariffs on all imported cancer drugs were scrapped and the value-added tax on the production and import of cancer drugs reduced. The 20-25-percent tariffs for cars were cut to 15 percent and duties on auto parts were lowered to 6 percent from the previous levels of 8-25 percent on July 1, 2018, followed by a reduction of import tariffs on over 1,500 investment products and consumer goods on November 1, 2018. The overall tariff level fell from 9.8 percent in 2017 to 7.5 percent in 2018. Moreover, comprehensive measures were implemented to expand imports. On July 2, 2018, the State Council, China's cabinet, issued a guideline on expanding imports to promote balanced development of foreign trade. It proposed 15 policies to optimize the import structure. Multiple channels were directed to promote imports and improve the conditions for trade liberalization and facilitation. 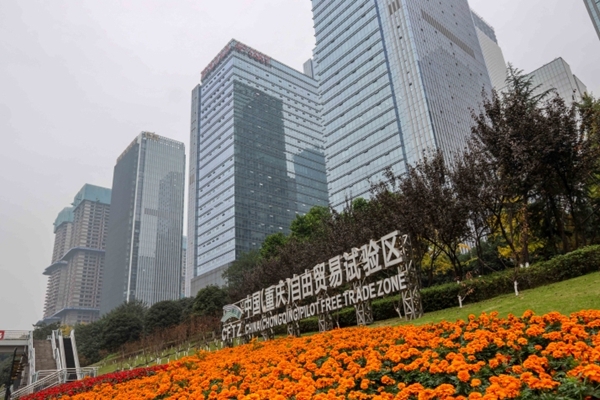 The first China International Import Expo, held in Shanghai in November 2018, was a major initiative to support trade liberalization and economic globalization. Over 2,800 exhibitors from more than 130 countries and regions and nearly 150,000 purchasers attended the six-day expo, contributing to trade exchanges and cooperation among countries, promoting global economic growth and stimulating the development of an open economy. By expanding imports, China aims to better meet people's growing consumption demands, increase the supply of high-end goods and offer more export opportunities to trading partners. China has accelerated negotiations to join the Agreement on Government Procurement of the World Trade Organization (WTO). As part of the preparatory work, it is seeking to improve transparency in government procurement of goods and services and in awarding project contracts. Both domestic and foreign enterprises are treated equally in the process. Problems such as lack of transparency, high costs and poor quality are being addressed. In 2018, China actively participated in global governance to provide a stable and sound external environment for foreign investors. The Belt and Road Initiative continued to be implemented, and the Forum on China-Africa Cooperation Summit in Beijing and the Shanghai Cooperation Organization Summit in Qingdao strengthened cooperation among participating countries. The country played a positive role in negotiations on regional trade agreements and regional and multilateral governance conferences such as the G20 Summit in Argentina and the Asia-Pacific Economic Cooperation Economic Leaders' Meeting in Papua New Guinea. It negotiated with the United States to ease economic and trade frictions. Its proposals on the reform of the WTO were widely accepted by member economies. All this contributed to safeguarding the multilateral trading system and advancing global trade and investment liberalization. This year, the aim is to transform China's opening up from a policy-oriented initiative to a rule-based one with an improved legal system and institutional arrangements. The increasingly broadened market access, stricter IPR protection, high-standard liberalization and facilitation of trade, and a transparent and sound legal system will provide the rest of the world greater opportunities for mutually beneficial cooperation. The author is dean of the Institute of International Economy at the University of International Business and Economics. At the opening of the Boao Forum for Asia Annual Conference 2018 in south China's Hainan province last April, Chinese President Xi Jinping announced a string of measures to expand opening up.